• Toyota Prius Plug-in Hybrid (2012-2014). • Porsche Panamera S E Hybrid (2014). 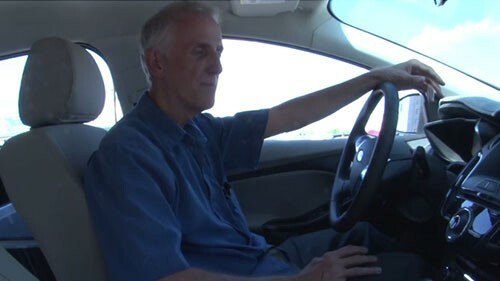 PHOENIX – When Jim Stack bought his Ford Focus electric plug-in, his passion to keep emissions out of the air was broadcast to the world. He can even drive across the country and not pay a penny in driving costs. Stack is part of an exclusive club for two reasons: having a plug-in electric vehicle and being able to sport a blue-and-white license plate entitling him to use the HOV lane even when it’s just him in the car. 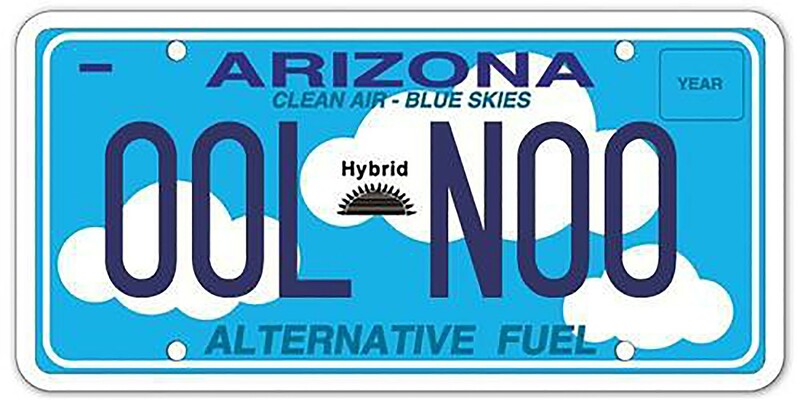 Starting in May, the Arizona Department of Transportation’s rules for Clean Air-Blue Skies plates changed to cover those who buy full-electric vehicles rather than hybrids. That’s in response to new standards from the Environmental Protection Agency. Someone driving a Toyota Prius, for example, may continue to use the plate and its privileges as long as they own the vehicle. But going forward that privilege is reserved for that model’s plug-in electric version model year 2012 and newer. Stack, the president of the Electric Auto Association’s Phoenix chapter, said that the change will spur electric car sales, adding that it’s for the better and should have come around sooner. “It’s something we’ve all been talking about: Why don’t they just make two lanes for clean vehicles and for HOV? Instead of limiting them, limit the lanes. And pretty soon we’ll have one slow-moving lane for those gas cars,” he said. The EPA has approved nine models that qualify for Clean Air–Blue Skies plates, ranging from the Chevrolet Volt (2011-2014) and Honda Accord Plug-in Hybrid (2014) to the Cadillac ELR (2014) and Porsche Panamera S E-Hybrid (2014). According to the U.S. Department of Energy, a conventional car emits 87 pounds of carbon dioxide for a 100-mile trip. A plug-in hybrid vehicle emits 62 pounds for that same trip, while generating the energy required for a fully electric car to make that trip emits 54 pounds. ADOT, the EPA and the Federal Highways Administration started the Energy Efficient Plate Program in 2007, allowing Arizona to offer up to 10,000 of the plates. There were 1,037 of these plates still available as of Sept. 7, ADOT spokesman Ryan Harding said. Harding said demand for the plates has slowed since the list of vehicles narrowed. The narrower list for the plates will encourage drivers to buy new electric-plug in cars, Harding said. John Martinson, founder of China Mist Tea Co., drives a Tesla that could eventually be added to the EPA-approved list because it’s fully electric, but he said he made the purchase to be environmentally friendly and to get the car he liked, not to get access to the HOV lane. “I got the Tesla because I’m an early adopter and I love the technology,” he said. Martinson said he looked at a variety of of hybrids before making his electric car purchase 14 months ago but found some companies put the label hybrid on as more of “an attache” without much emissions reduction. Clean Air-Blue Skies license plates allow certain fuel-efficient car models to drive in the HOV lane, even if the driver has no passengers. Recently, the Arizona Department of Transportation reduced which cars qualify - reporter Kayla Wall tells us why. 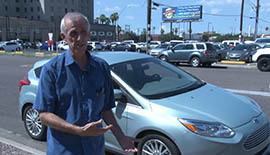 Jim Stack stands in front of his Ford Focus electric and explains the benefit behind an all-electric car. An example of the Energy Efficient "Clean Air – Blue Skies" plate. 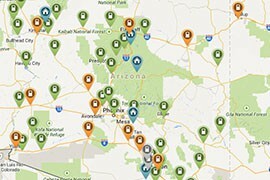 A map of stations across the U.S. where electric vehicle owners can go to charge their cars.